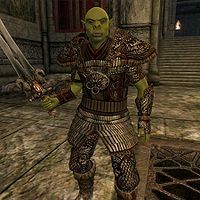 Grommok gro-Barak, an Orc warrior, is head of a group of adventurers – consisting of Syndelius Gatharian, Lewin Tilwald, and himself – who have turned their attentions to the Shivering Isles after having pillaged and plundered around Cyrodiil. They are the first to enter Xedilian after you have reactivated the Resonator of Judgment during quest Baiting the Trap. It was he who found Dawnfang/Duskfang in the ruins of Trumbe during one of his group's dungeon delvings. He is also the author of Grommok's Journal. As he reports in his journal, he dislikes Lewin quite strongly, whom he accuses of being incompetent and petulant. On the other hand, he admires Syndelius for his magical and historical knowledge. He wears an almost complete set of Orcish Armor: cuirass, greaves, gauntlets, and boots. He also carries a brown shirt he never wears. In combat, he relies on an unenchanted version of Dawnfang which will never change form, called Grommok's Blade. "This is supposed to scare us? Ha!" "We should just kill this stupid tree and move on." "Okay... this has to be a joke." As soon as you press a button, he will laugh: "What in Oblivion is that thing? Hahahaha!" and "What a joke! Let's be rid of this thing and continue on our way." If you unleash a horde of gnarls, he will shout: "Prepare yourselves for battle!" He will then draw his sword and fight off the creatures, although he doesn't manage to save Lewin. He is quite distraught seeing him dead: "Damn it! Lewin deserved better than this and I'm responsible. Someone will pay dearly, I assure you." If you decide to make the Breton go crazy, he will shout angrily while his companions attempt to flee: "Get back here, you cowards! Something's not right...." After the giant gnarl has disappeared, he will say "Wait... what's wrong with Lewin?" While Synderius urges him to leave he overrules him: "No. We'll pick him up on the way out. He must fend for himself." "Stupid rogue, just when we needed him!" "Can't you just wizard it open?" "Bah. This place is beginning to bug me!" "Bring it on... I'm ready." Once you press a button, he will snarl: "Blast! The cage is locked." If you then decide to kill Syndelius, Grommok will ignore the mage's pleas for caution: "Ha! Let's see them stop me after I rip this gate from its hinges!" He will then be blasted off his feet when a trap goes off and kills his last companion. Realizing what he has done, he will be quite distressed: "Sorry Syndelius. I don't know who built this nightmare, but if I get my hands on them..." If you decide to tamper with the mage's mind he will be annoyed: "If only Lewin were here... he could get us through this in no time." However, he soon realizes the treasure is not worth it: "Forget it! This is obviously a trick! Let's get out of here." As Syndelius manically looks through the keys that have showered down, he will try to dissuade him: "Let's get out of here, Syndelius. This is obviously a trick to waste our time!" and "They're all fake! Just come with me now!" 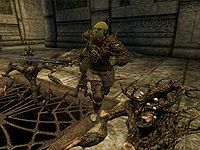 When he realizes there is nothing to do for the Dunmer, he leaves: "Bah! Suit yourself!" "Only me left... fine. I'll show 'em." "This place is giving me the creeps." "If I find out who's running the show... there'll be hell to pay." 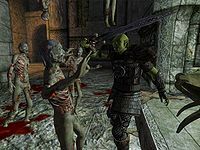 "How in Oblivion can I be dead?" "I can't be dead. I just can't be!" "No! This is all wrong! This isn't how it's supposed to be!" If you choose this option, he will later relocate to a cage room near the entrance of Xedilian; awaiting entrance in Sheogorath's realm. Baiting the Trap: Decide the fate of some greedy new adventurers in the Isles. 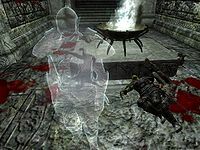 The ghost who may appear in the final chamber of Xedilian is a separate NPC: SEGrommokgroBarakGhosted. He is virtually identical in appearance to Grommok, except for his ethereal form. Grommok gro-Barak also appears in the story expansion Isle of Madness for Legends as the card Trouble Seeker. This page was last modified on 26 January 2019, at 23:37.